The U.S. Department of Transportation (DoT) has released the first data from its study of power levels for services seeking to use spectrum near GNSS frequencies for ground-based and other applications that could interfere with satellite navigation. 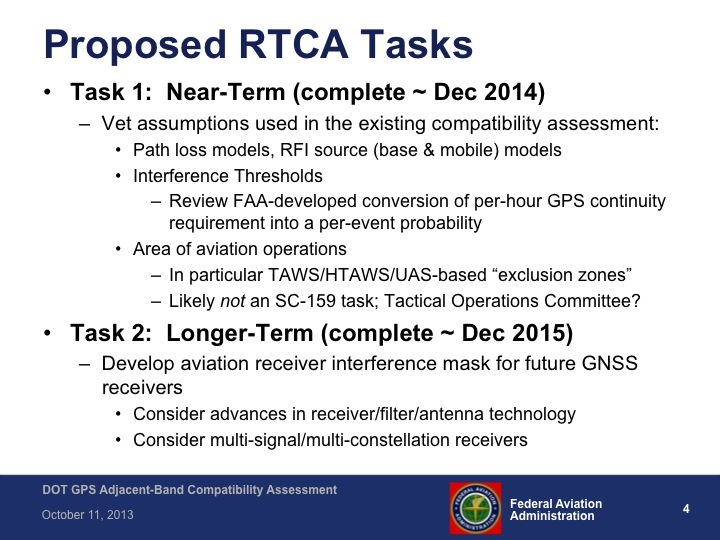 In a workshop held Friday in Washington, D.C., members of the DoT team presented the first results from the GPS Adjacent-Band Compatibility (ABC) Assessment — a wide-ranging effort to determine the power limits by frequency, or interference tolerance masks (ITM), needed to protect both existing and future GPS receivers. Test results indicated a need to limit interfering signals at different levels depending on the type of GNSS receiver being used. Preliminary ITM bounds have been produced for 10-megahertz LTE interference as a function of the interference center frequency. 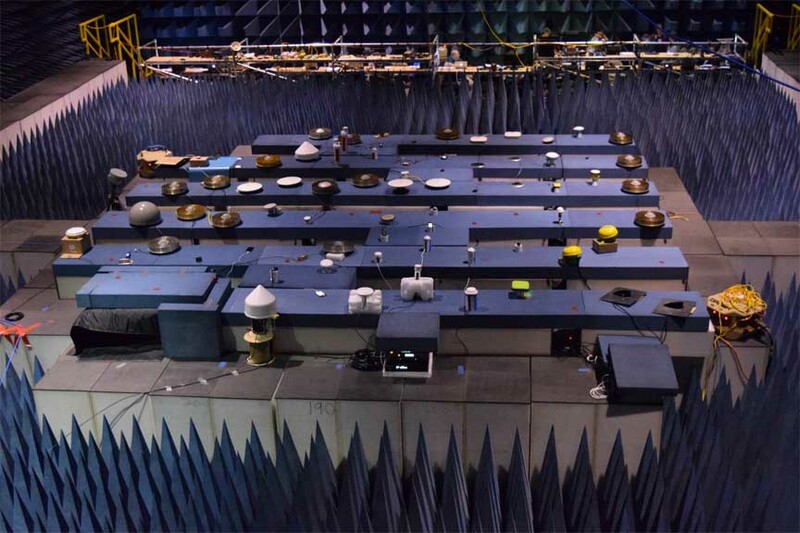 The set of tests, which focuses on existing devices, included a total of 80 receivers in six categories: cellular, general location/navigation, general aviation, timing, high precision and space receivers. In some cases more than one version of the same type of receiver model was tested. The category of general aviation receivers refers broadly to aviation receivers that are not certified. Certified receivers are being handled separately as is the testing of military receivers. The impetus for the ABC project was a 2010 proposal by Virginia-based LightSquared to repurpose frequencies neighboring GPS for a ground-based, wireless broadband network. In February 2012, after tests showed the powerful system would overload most types of GPS receivers, the Federal Communications Commission (FCC) put the plan on hold. LightSquared, now named Ligado, emerged from bankruptcy in late 2015 with a new owners and a modified plan that would forego using frequencies from 1545 MHz to 1555 MHz, the band closest to the GPS signals, and lower power limits. "We’re glad that DoT’s nearly two years of testing is finally over," Ligado said in statement after the workshop. “Now the government agencies with authority over our nation’s spectrum policy, the FCC and the NTIA, can take this information and all the other studies into account and make critical decisions." 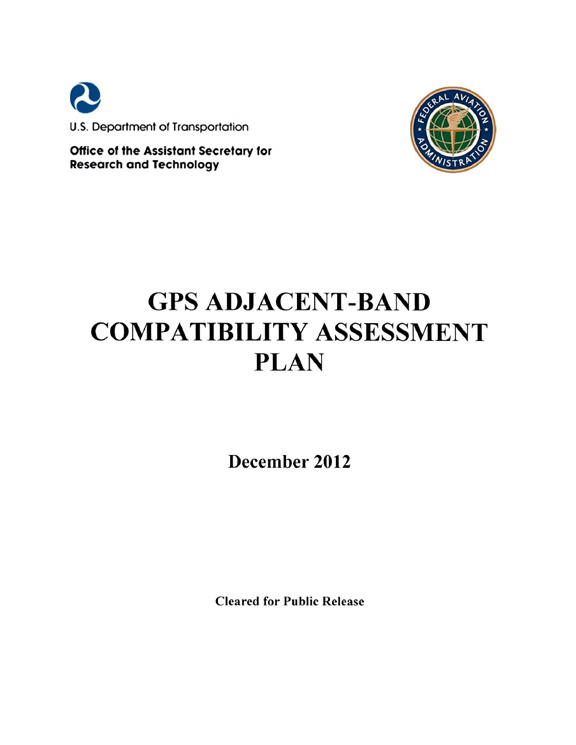 The two-part ABC Assessment, covering current and future receivers in succession, was suggested so that future proposals for using close-to-GPS frequencies could be more easily evaluated. The first round of tests, aimed at current receivers, was conducted from April 25 through April 29. Radiated receiver testing was carried out at the Army Research Laboratory’s (ARL) Electromagnetic Vulnerability Assessment Facility (EMVAF), White Sands Missile Range (WSMR), New Mexico, using a 100 x 70 x 40 anechoic chamber. Each test was repeated across two days with the results being averaged for each receiver. In July, Zeta Associates, a consulting firm in Fairfax, Virginia, conducted wired (conducted not radiated) receiver testing focusing on the effects of interference on GPS/GNSS signal acquisition. The signals used in the test included GPS L1 C/A-code, GPS L1 P-code, GPS L1C, GPS L1 M-code, GPS L2 P-code, SBAS L1, GLONASS L1 C, GLONASS L1 P, BeiDou B1I and Galileo E1 B/C. The DoT team tested within 100 megahertz on either side of the GPS L1 center frequency of 1575.42 using a 10-megahertz LTE signal and a narrow bandwidth 1-megahertz bandpass white noise signal. The tests were conducted for GPS and GNSS receivers processing signals in the 1559–1610 MHz Radionavigation Satellite Service (RNSS) frequency band, as well as receivers that process Mobile Satellite Service (MSS) signals in the 1525–1559 MHz band to receive differential GNSS corrections. The tests determined the power levels at which each device experienced a one-decibel degradation in the carrier-to-noise density ratio (CNR) at a particular frequency. The DoT team graphed results for each device. Combining all the graphed results for a category created a visual map of dots and lines that outlined the borders of the power-limits needed to protect all the existing receivers. The patterns were similar, although not identical, across the receiver categories, with the recommended power limits the lowest in frequencies closest to the GPS bands. The presentations and results given on at the October 14 workshop will be posted the week of October 17 at <gps.gov/spectrum/ABC>. The strictest limit for both the general aviation, general navigation/location, and timing receivers was a little below –80 dBm at about 1550 MHz, while space-based receivers were equally sensitive on both sides of the RNSS band with the toughest limit being about –85 dBm. "These results are generally consistent with past testing," said Chris Hegarty of the MITRE Corporation told Inside GNSS. Hegarty reported during the workshop on work being done on determining antenna characteristics. One interesting conclusion came from comparing the masks being developed for certified aviation receivers with the other six masks. Ligado has pledged to defer to the Federal Aviation Administration (FAA) to set power and out-of-band emissions limits to meet aviation safety standards. It seemed possible that those limits might effectively address interference with other types of receivers as well. However, when the mask for certified aviation receivers was overlaid with masks for the six types of receivers it was clear that was not the case. "The point here is that, everything else being equal . . . protecting the FAA-certified mask, adhering to that, does not necessarily protect the rest of the receiver categories," said Hadi Wassaf, technical lead for GPS interference analysis at DoT’s Volpe Center. Wassaf presented some of the findings during the workshop. DoT has shared the raw data from the tests with other federal agencies — handing over all two terabytes of it if an agency was interested, said Karen Van Dyke, director for positioning navigation, timing and spectrum in DoT’s Office of the Assistant Secretary of Research and Technology. Not all of the data will necessarily be made public however, she said, citing the nondisclosure agreements signed with receiver manufacturers in preparation for the tests. "As you see we have had the data aggregated together, and we’ve always indicated that it would be interference tolerance masks," Van Dyke said. The interagency partners may be doing more detailed analysis, she said, but "at this point I don’t think there any plans to share all of the raw data — again something that we can take into consideration if there is specific information that is of interest." Ken Zdunek of Roberson and Associates, which did one of two studies for Ligado looking at using position error as a metric for judging harmful interference, said his firm was "intensely interested in the position data" collected during the tests. The suggestion that position error as experienced by the user is a better yardstick has been widely opposed by the GPS community, which relies on the more established metric of degradation in the carrier-to-noise density ratio. "We do have concerns about the use of such [position error] data as performance metrics," said Hegarty. "A lot of these receivers, even if you took GPS away in a stationary test, it would continue to report latitude and longitude where they were last. So, it really isn’t showing that the receiver is still functioning even though it’s showing correct position even when the signal’s gone — jammed to the point they are not tracking anything. Those are some of the things that would need to be considered, I guess, for folks who are exploring those other metrics." "We did this for several months. Been there done that. We understand that," said Zdunek. "We can certainly tell what a receiver is generating latitude and longitude to 10 decimal places for 10 minutes that we’ve lost lock." It was pointed out during discussions that the masks protect all the receivers, even in cases where there is a single receiver that needs a lower power level to operate without interference. Chris Kurby of Greenwood Telecommunications Consultants LLC, which has worked with Ligado in the past, suggested that rather than protecting all existing receivers the goal should be to protect 90 percent of the receivers or some other specific percentage. "I think we’re on a slippery slope here," said Van Dyke. "Without knowing which receivers of those are in the applications they support, I don’t think that is a good approach. The approach was to protect the existing receivers that are out there. We know that these were all receivers that were brought to us for testing to support existing applications. I would be very uncomfortable starting to move away from that without additional information to make informed decisions." The next step, said Van Dyke, is the development of use cases — something for which she asked industry’s help. The use cases, according to the test plan, define the regions of operations for a receiver — urban areas versus rural, for example. They also identify applications that "that are vital to economic, public safety, scientific, and/or national security needs and any other factors supporting why this particular receiver model is important to be tested (e.g., quantity in use, economic impact, etc.)." The information required according to the test plan, can be covered by a non-disclosure agreement. DoT will use “inverse modeling” to transform the bounding masks to allowable transmit power levels for each category of device.